This program is recommended for those who do very little exercise or have a fairly inactive lifestyle, for example, a job that requires them to sit down most of the day. This also suits anyone who has bad posture while sitting or standing naturally even if they do exercise regularly. This program is ideal for those who exercise on a daily or a weekly basis but does not strength train. It’s also suitable for those who have a job which requires them to be active most of the day. This program has been designed for those who strength train at least 3-4 times a week on average or someone who does a high amount of exercise. 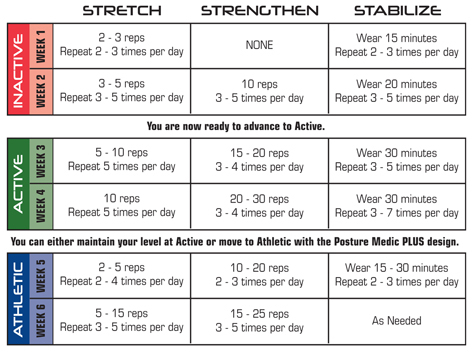 If posture is poor, starting with the Posture Medic Plus but following the Inactive program is recommended to begin training your posture as this can help to loosen pectoral muscles in the early stages of training. – 75% of the population should start with the Original Strength before moving on to the Plus Strength. – Those who are Obese (classed as having a BMI of 30 and above) may need the Plus Strength even if they do very little exercise as it helps to support bulk in the chest area.